Sylvester Stallone is on the hunt for a “young Sigourney Weaver” to complete his cast for the next The Expendables movie . The action man has taken to using Twitter.com to try and recruit veterans for The Expendables 3 after recently posting the note “Calling SEAGAL” in the hope of persuading Steven Seagal to join the project. Nicolas Cage and Jackie Chan are also being considered as additions to the cast, according to multiple reports. Sylvester Stallone is wading into the assault weapons debate in the U.S., insisting no civilian should have access to the big guns his characters use in action movies. President Barack Obama has been urged to introduce new gun legislation following last year’s massacres at a cinema in Colorado and a school in Connecticut, and celebrities have started taking sides. Stallone appears to back new laws to prevent people from purchasing semi-automatic weapons because he doesn’t think the guns are necessary for self-defense. The Rambo star tells the Associated Press, “I know people go, ‘They’re going to take away the assault weapon’. (But) who… needs an assault weapon? Sylvester Stallone has finally landed a deal to adapt James Byron Huggins’ novel Hunter into a major new movie, according to industry reports. The actor/director has owned the film rights to the book for the past decade, but he has never been able to nail down a production deal – until now. According to Yahoo!, he has teamed up with executives at Lionsgate and is hoping to release the movie in 2014. Stallone will write, direct and star in the thriller about the search for a mythical beast in the Arctic Circle. The film will be shot in 3D. Robert DeNiro and Sylvester Stallone are set to put the gloves back on – they’re rumoured to be playing rival boxers in new movie Grudge Match. De Niro won an Oscar for his role as fighter Jake La Motta in 1980’s Raging Bull, while Stallone found fame as down-on-his-luck boxer Rocky Balboa in 1976 film Rocky. Now both Hollywood legends are reportedly preparing to face each other in the ring in Grudge Match, which is scheduled for release in 2012. The movie tells the story of two ex-boxers— Billy ‘The Kid’ McGuigan and Henry ‘Razor’ Sharp – who agree to come out of retirement for one last bout, according to The Hollywood Reporter. 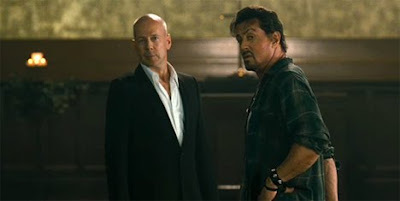 Sylvester Stallone is trying to persuade his pal Bruce Willis to play a supervillain in The Expendables sequel. Willis had a small cameo role in the summer blockbuster and now Stallone wants him to lead the cast in an all-action follow-up. Despite initially claiming a sequel would be too expensive, Stallone appears to have been fired up by the film‘s success – and he’s now considering a second installment.